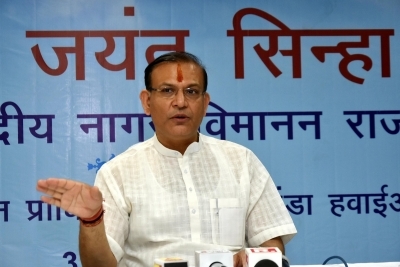 New Delhi July 12 (IANS) Union Minister Jayant Sinha on Thursday challenged Congress President Rahul Gandhi for a live debate on the lynching case in Jharkhand s Ramgarh saying the Congress leader had taken the attack against him to a personal level and should not hide behind social media handles. Sinha who has been strongly criticised by the opposition for meeting and garlanding eight convicts of a lynching incident in his Lok Sabha constituency in Jharkhand and had on Wednesday expressed regret for his act threw a challenge to Gandhi in a tweet on Thursday and appended a statement. "Rahul Gandhiji has taken the attack against me to a personal level. He has condemned my education values and humanity. I challenge him to a live debate in Hindi or English on the Ramgarh lynching case. "If he thinks that my personal conduct is disgusting then let s debate it in a civilized manner " he said adding that let him not hide behind his social media handles and practice shoot-and-scoot politics. Gandhi had on Tuesday slammed Sinha s action of felicitating seven convicted cow vigilantes after they were released on bail terming it as disgusting and had sought support for a petition that seeks withdrawal of his Harvard alumni status. In his statement Sinha said the events in Jharkhand s Ramgarh on June 29 were distressing and terrible. "As I have said repeatedly vigilantism is totally unacceptable. Guilt can only be established through due process because the rule of law is supreme in our constitutional democracy " said Sinha who is a Minister of State for Civil Avaiation. He said that those who commit "vigilantism and break the law should be fully punished". Sinha said that many social media participants various political parties and some media outlets have said that "I sympathise with vigilantes because I welcomed the Ramgarh convicts at my residence." "I did not intend anyway to condone vigilantism and I sincerely regret if that s the impression I gave " he said. He also said that the matter is currently sub-judice and the due process of law should be respected. "The fast track court trial records fast track court judgements and the High Court s bail orders are available in the public domain. I would earnestly request all those who are interested to study these materials carefully and form their own independent views on this case " he said.